Rendy Nelson, director of spa and wellness at the Woman’s Athletic Club (WAC) in Chicago, Illinois, shared with the GWI how she embraced The Wellness MoonshotTM Calendar “heart” wellness theme for February, incorporating heart-focused actions in their monthly staff meeting on February 19 (the day of the full moon). We hope her story inspires you to lead similar moments within your organization or community and share them with us. Inspired by the full moon and The Wellness MoonshotTM, we hosted our monthly all WAC staff meeting on February 19. 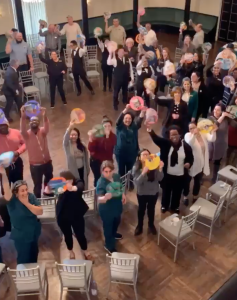 Staff members were welcomed with a You Are Beautiful snack of their choice and invited to rest in the circular “moon” setup to foster community while our general manager shared his agenda before turning it over to me. 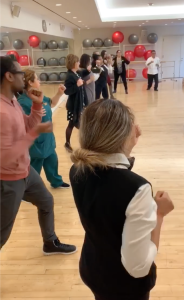 The staff was divided into three groups by snack choice to enjoy heart-opening chair yoga, a self-defense class, and create an inspiration “moon” board to attract more wellness and happiness in their lives. All day, we offered 10-minute chair massages by one of our new full-time therapists. She moved her chair to each floor, capturing employees of the respective departments and allowing managers/fellow employees to easily cover their post during their massage time. This was especially appreciated by the receptionist, switchboard, and café and dining room staff who typically cannot make the all staff meeting. The morning of the meeting, we put up signs and bags with tokens on each stair landing for employees to pick up at each passing. Extra raffle tickets for the Raffle Bar were given out per token/floor at the meeting. As employees arrived at the meeting, they selected a snack of their choice: pretzels, M&Ms or almonds. Each snack bag contained two You Are Beautiful stickers, one for them to keep and one for them to give away. This is also how we made our three groups for the activities. Chair Yoga. Heart-opening sequence while seated, standing and using the chair as a base for movement and stretching. Self-defense/safety awareness. Employees learned about real-life scenarios, general safety awareness, personal weapons and basic hit and kick techniques. Inspiration “moon” boards. Employees gathered five to six pictures of what they want to attract in their lives from a collection of previous months’ magazines of American Spa and Pulse, in addition to the monthly fashion/travel/home magazines, and pasted them onto moon-shaped boards. Silva, the national educator for Dazzle Dry, provided polish changes for the spa and wellness team after their internal on-site training, which happened to line up on the same day! Raffle tickets were given to all employees who attended the meeting, participated in each activity, and for each floor walked from the stairs challenge. Employees placed their tickets in the respective bowl of the prize they wanted to win, ranging from four cash prizes, a massage at Massage Envy, and a float session at Float Sixty. It was truly a fun day and employees continued to comment on how much they enjoyed all the activities. My general manager supported me in hosting the first wellness hour back in November 2018, which was a Gratitude event. We did three groups of three mini sessions of Zumba, self-defense and gratitude, where employees wrote thank you cards to fellow colleagues. Over 200 cards were written, even some to members. These were sorted and distributed after the meeting, spreading more love and gratitude. We are now hosting these events quarterly…and they are a big hit so far! Thank you, Rendy! Can we join you all next time?!? It is truly wonderful to see how companies are embracing The Wellness Moonshot Calendar and we are really impressed with what you put together. Look forward to hearing how the next one goes.